Here is a real treat – a mid 1950’s Kay Pro K172-B thinline archtop electric guitar in a relatively rare blonde finish. During the 1950’s the electric guitar became increasingly popular and manufacturers like Kay stepped up to satisfy booming demand. Notably, in 1952 Kay manufactured the second successful electric fretted bass after the Fender Precision. That model, the K162, became known as the ‘Howlin Wolf’ bass as it was used extensively in his band. 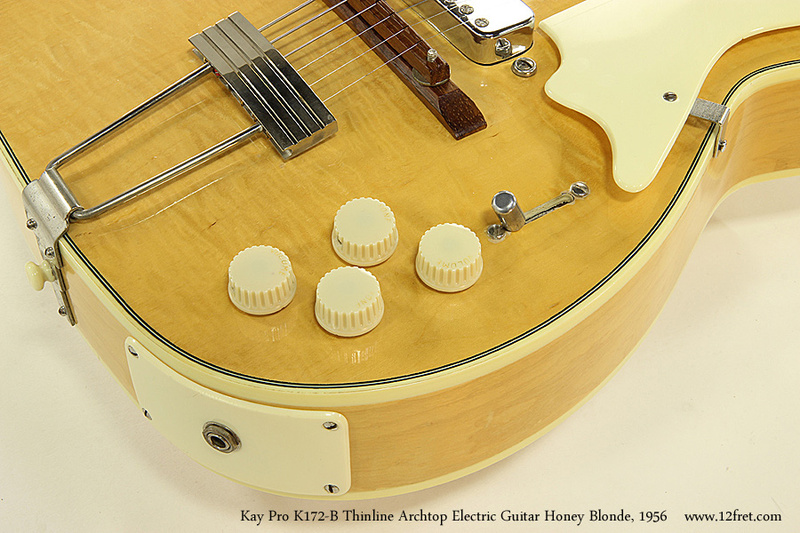 In 1954, the Kay Pro K172 appeared, as an electric cutaway archtop with two pickups. The K172 was built until 1957, normally as the “K172-S” in sunburst. The K172-B, with Honey Blonde finish as seen here, is fairly rare. Kay referred to this body size as ‘Pro’, 12.5 inches wide across. These weren’t always cheap instruments. In 1957, the K172 had a retail price of US$215, which translates roughly to nearly US$2,000 today. In 1958, Kay gained the endorsement of jazz great Barney Kessel and the K172 model became the K1700 Barney Kessel model, with a signature pickguard and ‘Full Kelvinator’ Kay Crest headstock ornamentation. The pickups also changed to a ’tissue box’ style, but the body and neck are basically the same. This Kay Pro K172 B Thinline Archtop example does not have a serial number, so it’s hard to date it exactly. 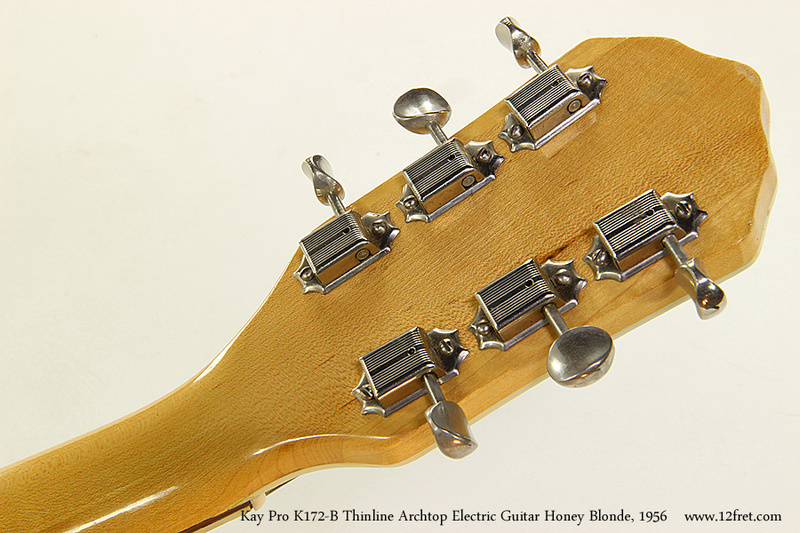 The 1957 Kay catalog shows the Honey Blonde finish and most images show only the sunburst finish. However, the tuning gears used were made only until 1955 and the pickups between 1955 and 1957, so we are assigning a date of 1956 to allow for use of parts stock. 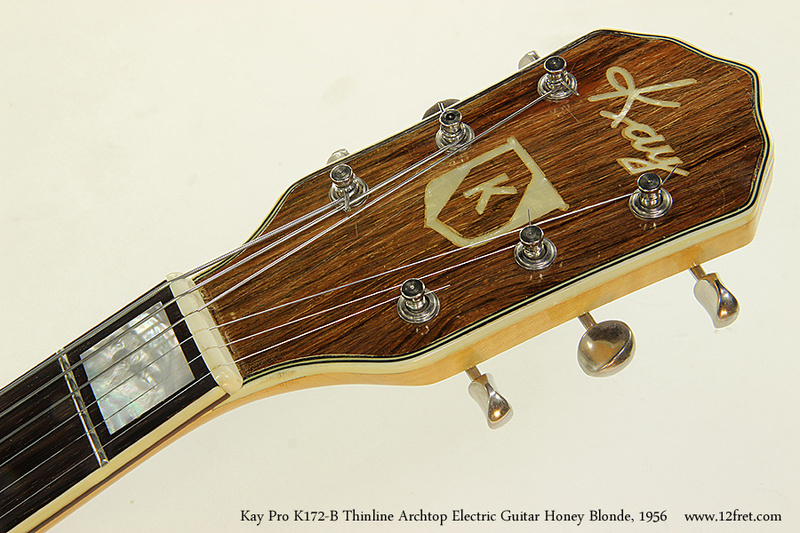 The Kay Pro K172 B is largely maple. The top and back are nicely figured maple laminate pressed into an arched contour and the sides are the same material. The neck is solid maple, one piece, with bound rosewood fingerboard. The bridge and headplate are also rosewood. Interestingly, the block position markers are Mother of Pearl, not plastic. The plastics are in good condition, four ribbed rotary controls and a shaped pickguard, with no cracking. You may notice that the body has no F-holes, and the output jack is mounted on a rather large piece of curved plastic. That piece not only mounts the jack, it covers the access hole for installing the pickups and controls! Metal parts are nickel plated. The tailpiece is a trapeze with three lines on the sting bar and a stair-step hinge. The pickups are single coils with individual pole piece screws. Kay advertised them as ‘Hi Fi’ pickups, but they are also sometimes known as ‘Speed Demon’ models and were used from 1955 to 1957. Kay used pickups from various manufacturers; at one point they apparently bought a carload of pickups that Gibson had decided not to use after settling on the P-90. The tuning gears are Kluson ‘No-Line’ models, which were made from 1950 to 1955. In 1956, these tuners received a single line of text down the center of the casing reading ‘Kluson Deluxe’. After 1964, that text was spread over two lines, one ‘Kluson’ and one ‘Deluxe’. The finish is a clear gloss lacquer and is in very good condition considering the age. In terms of playability, this guitar is fine. The action is good, fretwear is light, and it’s strung with flatwounds. It is very comfortable to play. The scale length is surprisingly long, 655mm or 25.78 inches – longer than a Telecaster by a quarter inch. The nut width is 42mm, or 1.65 inches. Weight is 2.78 kg or 6.2 lbs. Overall, this guitar is in exceptionally good condition, with few marks. There is a dent on the bass side of the neck around the 7th fret but otherwise it is very well preserved. The original brown hard shell case is included.